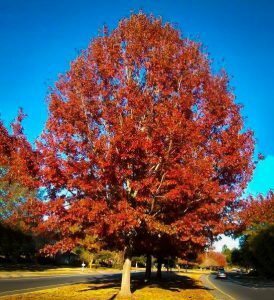 The Red Oak is a large, deciduous shade tree, which grows well in all but the most northern and southern areas of the United States. It is a showpiece tree that will be the centerpiece tree of most landscapes which plant it. This amazing tree offers beautiful green foliage throughout the summer months and then dazzles with rich color in the fall. A large tree, it will reach a height of 50-75 feet tall as well as wide. It will last a lifetime. This is a moderately fast growing tree, which is different from many other species of oaks. There is a requirement of full sunlight for the Red Oak to grow most effectively, and due to the size it is going to demand ample space to allow for the full range and effect of its grand shape. Care must be taken to assure that structures such as walls, fences, sidewalks, and other plants are not encroached upon by the spreading of the limbs and roots as the tree grows to maturity. It is best to make this evaluation prior to planting the tree, and if the available space is too small a smaller tree should be chosen. Water requirements are very low for this tree once it is established. 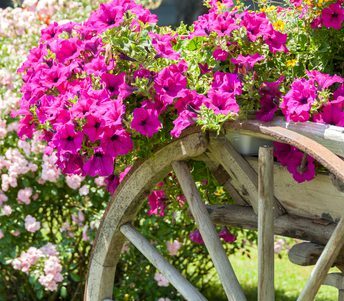 It tolerates dry, drought like conditions. Leaves are several inches long, smooth and shiny dark green on the top and coarser underneath. The dark green leaves turn brilliantly in the fall. The Northern Red Oak can be distinguished by its dark reddish brown bark along the length of the trunk. It is the only one of the oak species with this type of bark pattern. The Red Oak needs soil that is well-drained, preferring a slightly acidic pH. It will likely be difficult for this tree to grow well in a highly alkaline soil.